My portfolio passed the sixth hundred K mark today due to non-periodic income from my profession. Company restructuring and departure benefits from my previous employer have helped boost my contributions despite the recent market volatility. It's been a stressful few months but in the end it all worked out. I will save all of this cash for further investment into the stock market. I do not expect anymore large one-time income additions in the next several months unless there are items that need to be accounted for during tax season around March of next year. 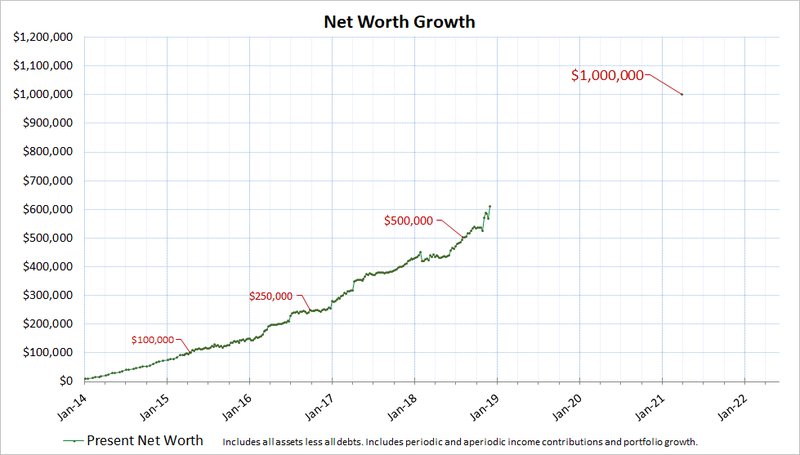 To reach my goal of $1MM I am relying on both my income, high savings rate, and the growth of my portfolio. Since I am approaching the latter period of my goal, I will be relying more on my portfolio than in the beginning years. If the portfolio cannot carry itself forward, then my goal will likely be pushed out a year or two. Right now the portfolio sits at around $55K in cash. It is nearly 10% of my portfolio and to me this is getting a bit too much as I am always looking to find ways to get those dollars to generate income. I have been watching the market but recently it has run up again, although still lower than the peaks. I think there will be more volatility due to Trump's tax policies against China and the higher interest rates the Fed is currently pressuring with, and this weekend there is a G20 meeting between Trump and Xi. I will wait to see what materializes next week before making my next decision. I think this is a great idea. But Juul may not be so keen on having an old big company like Altria take control of them. Altria has the cash and expertise to invest into the future to compensate for the decline of their traditional business. They are in a strong position with a lot of free cash flow which allows them flexibility to invest. I just crossed a 400k € net worth. Next Monday thanks to Trump+Xi, my stock portfolio will most likely explode above a 300k € level. Hello! I can only congratulate your work. I'm also equally thinking of you as you are and, I'm happy to be in a group with you in the income heroes. Unfortunately, it is actually more and more difficult to find good targets for free money, but next year we will certainly have the opportunity to do so.